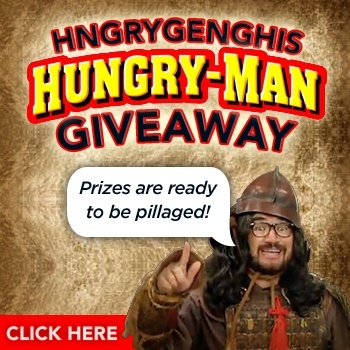 The mighty Genghis Khan has come to The Escapist bearing gifts thanks to Hungry Man! It's no secret that Genghis Khan loves videogames and pillaging. Every history book we've ever read clearly states this as fact. To our delight, a new chapter of Genghis Khan's historical love affair with videogames begins as he quests to defeat Steve Hungryman and every videogame in existence. He has already sent Susan Arendt an amazing set of gifts that have come from his centuries of pillaging and now he has more to give away, this time to The Escapist community! How would you like to own a limited edition hngryGenghis helmet or a $75 GameStop gift card? I'm not sure where Genghis got them, but I'm not about to ask questions either. You must be at least 18 years of age and currently residing in the United States to participate in this event. To enter your name into the drawing, click here and good luck!